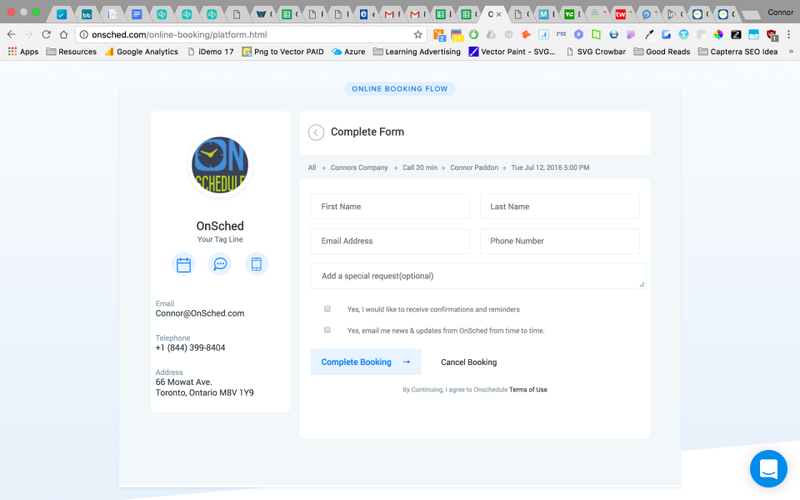 Medium / large businesses, and small and medium enterprises who are looking to build an online booking solution into their application or organizations. Cons: There are certain limitations to the software that I don't quite endorse, and would love to have more accessibility to customize the features inherent in the system. For instance, we would love to be able to format, on our own, the infrastructure of the Administrator, Reservationist, and Staff roles to allow for certain levels of access to information. This is actually something that they are working on right now from my questions about it - which is great! 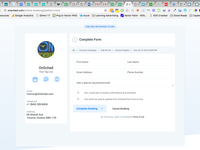 For the past 14 months, my experience with onsched has been nothing short of excellent. I was pretty surprised at the lengths they went to, to convince me to switch from Genbook - and I'm glad I did. The people at this company are very well educated from what I could tell - and are really very smart. My on-boarding representative had a background in marketing, helped me change some stuff on my website that was completely unrelated and then ended up helping put together a marketing plan for me. I was pretty blown away by this; it's honestly helped our business. OnSched really is just solid!! Cons: There's a few things that are a little bit confusing in the portal that take a little bit of getting used to. Or maybe it was just us.. I think the best part about using onsched is the new business we're getting. I didn't realize how effective email marketing was. It's pretty cool when we're slow to be able to just hit email customers and let them know that we have open spots. Very cool.. Your staff knows the system very thoroughly, and we've managed to push through a few little problems we had early on without pain so thanks so much guys!!! Recommendations to other buyers: Take the plunge, it's worth it! Pros: Everything is very clean and easy to use, the customer service is really really worth it in itself. Overall: I had a wonderful experience start to finish with OnSched. Their customer support people really know what they're doing which is really helpful to someone like me who doesn't catch onto the whole "tech" thing easily. We have a very complex business where we see a lot of students on a weekly basis, have quite a few teachers and also run classes. I was pretty close to giving up on the whole online idea that my colleagues were pushing, however in hindsight I'm glad I didn't. Although the setup process took a few days longer than I thought, everything went relatively very smoothly. They help me through every step, right through to helping train our teachers on how to use it. They also installed the online booking part right into my website which was very cool. Thanks Mitchell for the AWESOME customer support! Pros: The customer service is amazing. They really care about the clients that they have. They work hard for my business and I like that! Overall: Ok this is great for my shop. I had a wonderful experience!! Mitchell helped me with literally everything that I needed done. It was excellent. They helped fix a few bugs on my website as well, they totally went above and beyond!! 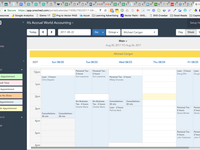 Comments: We bought this to schedule 30 minute meetings for our consulting company with the higher level execs, one of the main features that we wanted was pre-approved booking which not a lot of scheduling companies have. 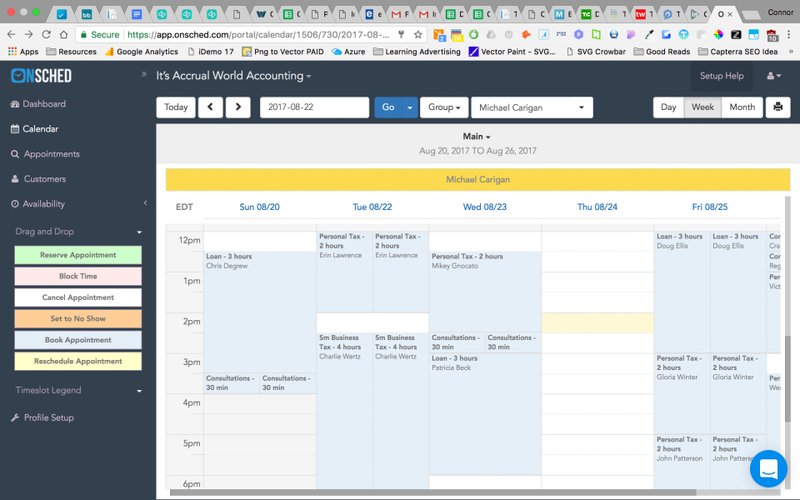 Connor & John were extremely helpful in getting this up and running, we now have to verify all new meeting requests, and our pre-approved registered users can book meetings directly into our executives calendars. The Google / Outlook sync's are great too, being able to tie into the existing schedules made it pretty much a no brainer. The setup wizard was straight forward, we had it up and running in half an hour and were comfortable with it by day 2. Not a real learning curve with these guys. Simple, elegant and to the point. Comments: I couldn't be happier after switching from GetTimely to OnSchedule. Kevin helped me get through the first couple of days when I had a few annoying questions, and after that it was off to the races. The only thing that I wanted to have that was pretty custom was the ability to somehow filter out who was a first time caller. They didn't have this, and they did this CUSTOM for me and now have it for other users. Pros: I love that this software is very user friendly and easy to use. I love that it makes keeping all of our appointments on time. 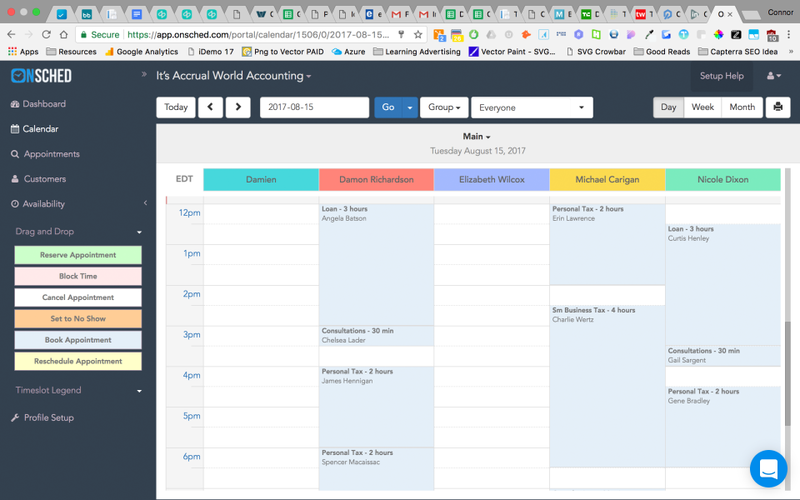 We are a service based company so we get lots of appointments each day/week and this software allows us to stay on top of our schedule. Cons: There is nothing that I really didn't like about OnSched. I would give it 5 stars all the way around. Its easy to use and affordable. Pros: There is pretty much nothing this app can't do. I unwittingly threw quite a few curve balls (e.g., providers in different international time zones with different schedules) and, with help from tech support, I was able to do everything I needed to do. Customer support is very responsive and incredibly helpful, answering all my questions and doing a lot of the setup for me. 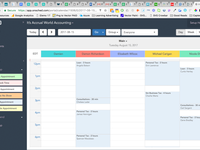 My understanding is the interface is being re-vamped, and with a simpler user interface built on top of their already powerful engine, I suspect it will be one of the best scheduling systems out there. High Quality Assistance Setting Up....Practical and Easy To Use Program...Great Price! Overall: So grateful for the price! I am starting a new business and need things to be affordable and easy to use! This program is great! The customer service was outstanding....extremely helpful in getting me started and assisting me with setting up a schedule that will suit my new business. Comments: So far so good! Only issue is sometimes appointments are not saved properly because of an error which states 'OFFLINE'. Not sure what that means, but it doesn't happen often. Thanks so much for the review. What you're seeing with the timeout error is just a fail safe that logs you out of your account after an hour with no activity; when you see that, just do a page refresh if it doesn't route you to the login screen automatically and you'll be good to go. Comments: I had a wonderful experience with OnSchedule. 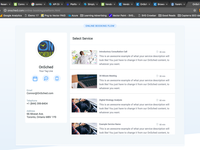 They worked with us to customize everything exactly how our company wanted it and even made updates to the system to add in features we requested. Mitchell and John provided exceptional training and support. They were great to work with and I would definitely recommend this company. I intend to work with them again in the future. Comments: We started using onschedule for our car rental company and we couldn't be happier. 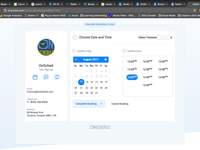 We have been able to provide our customers with an easier channel to book their rentals, and we have also been able to fill more of our appointments due to the automated marketing feature. Hey Steve & Richie, so glad you guys are happy with the product. We look forward to working with you long term! Pros: This product is easy to use and intuitive. it sends out information immediately if a change is made, and can email or text the affected employees. Cons: Can't schedule multiple shifts for an employee. Comments: Our rep has been awesome in tayloring OnSched to my needs, despite glitches to the system that have caused inconvenience and confusion for both me and my clients. But, I realize you guys are in a learning curve and for a small amount per month I can deal with it. There are certain service values that I need and want and so far our rep has done his best to try to make that happen. Some are hit and misses but again, we are in process. Cons: Nothing too too bad, the performance could be a little smoother. Pros: Easy to use, customizeable, great customer service. Cons: My customers don't really like having to create a profile before booking an appointment. 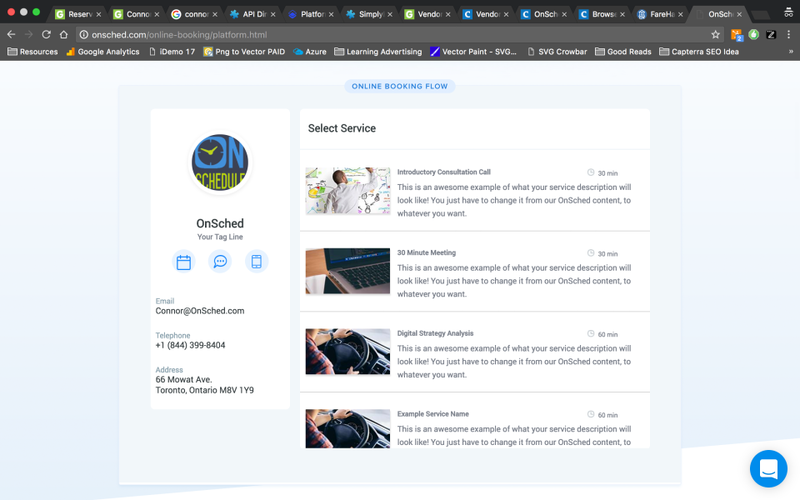 Overall: My experience using OnSchedule has been quite exceptional. I needed some things with this software to be customized for my business, and the staff were so happy to help and went above and beyond. 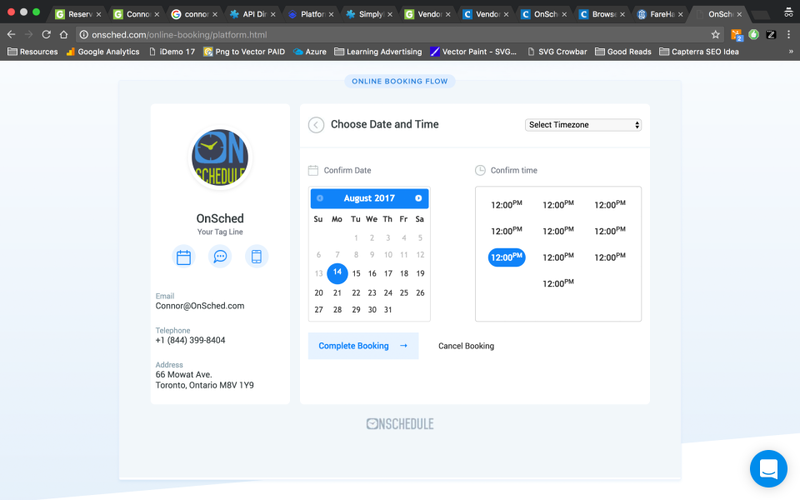 My customers rarely book online, but when they do, OnSchedule is a good option for them. For your account, there's actually a setting that can be changed so that your customers don't have to create a profile in order to book an appointment. Overall: The platform works really well for us. We don't really use the bells and whistles but it works perfectly for what we want to do which is scheduling our tattoo artists. Pros: It's a good way to see my schedule for work. Cons: There's bugs that make it slow and glitches sometimes.